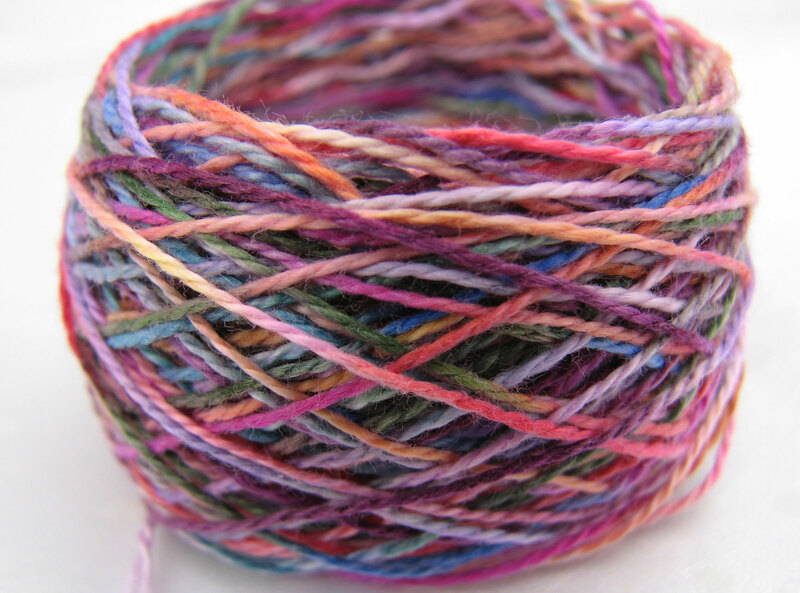 What’s so faux about this painted yarn? I didn’t use paint! Nope. What did I use? On a recent episode of The Martha Stewart Show she made a “tie-dye” t-shirt with a technique using Sharpie Markers and rubbing alcohol (see it here). My creativity lightbulb went off! “Can I do that on yarn?” The answer is YES! I have Bic brand permanent markers instead of Sharpie, but they worked just fine. When I finished the yarn, the colors I chose looked so good together. 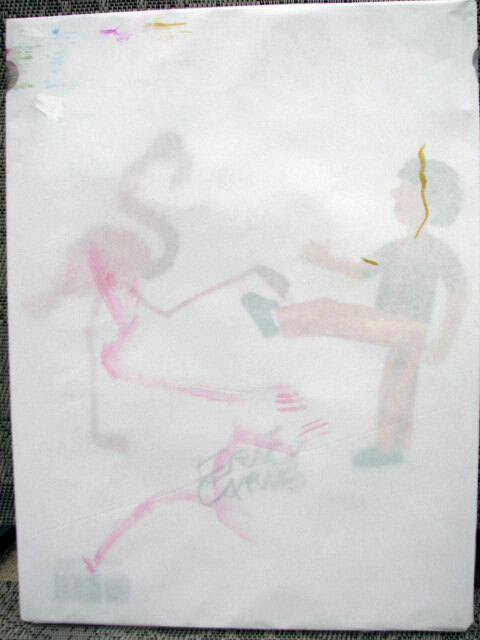 Then I realized I used a Bic Color Collection set of markers. They were made to go together! There was no way I could mess up the color combinations. 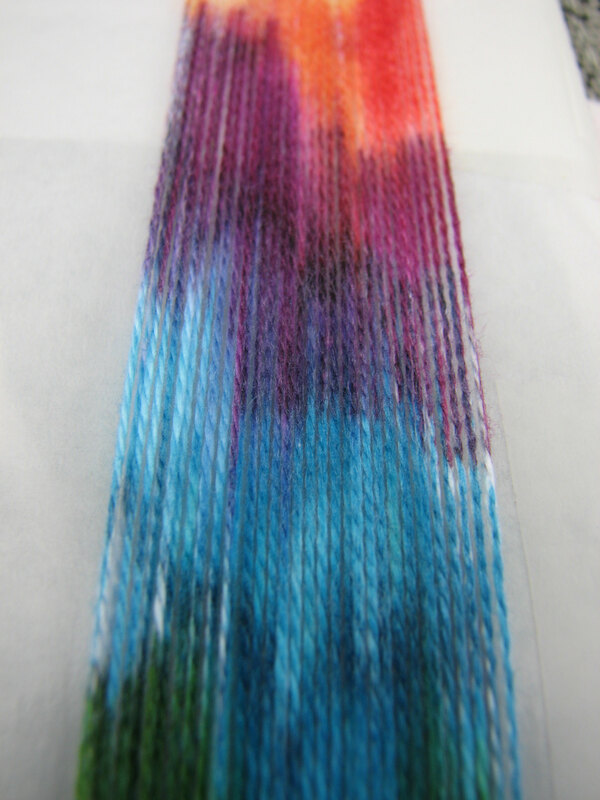 So, following Martha’s directions, with slight variations, I made my first “painted” warp. Wrap a piece of cardboard parchment paper. I wrapped one of my 2 year old’s books like a present (it was the perfect size and no harm came to it! ), waxy side out. I did also slip a piece of paper towel under the yarn, to absorb any excess color. Heaven for bid, Eric Carle’s “From Head to Toe” be ruined! 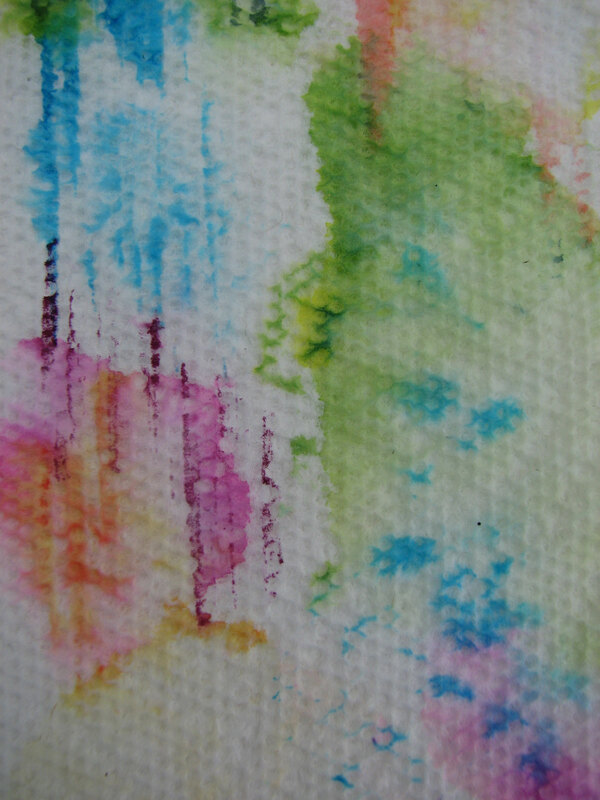 Doesn’t the paper towel look pretty too? Wrap white 10/2 perle cotton around the covered book as many time as necessary to get the length of yarn you want. I wrapped about 35 times. Start coloring! 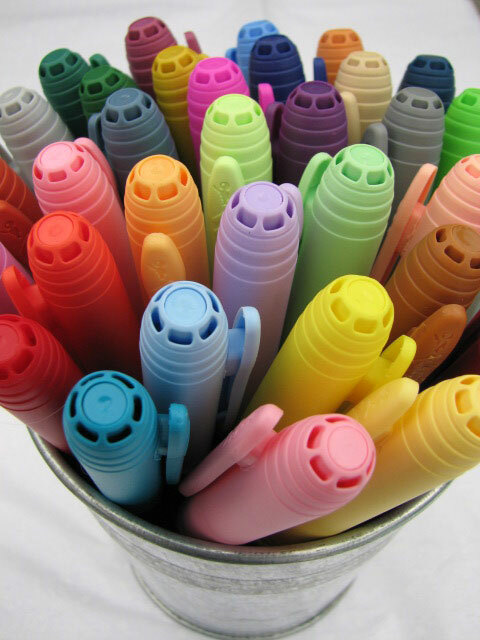 Color in 1″ – 2″ sections with slight gaps of white showing between each color. Stop after every few colors and add a few drops of alcohol at the edges of the colors. I found the colors blended better when the ink was still wet. Tip: I didn’t have an eyedropper, but a cotton swab dipped in the alcohol and dabbed on the yarn worked just fine. 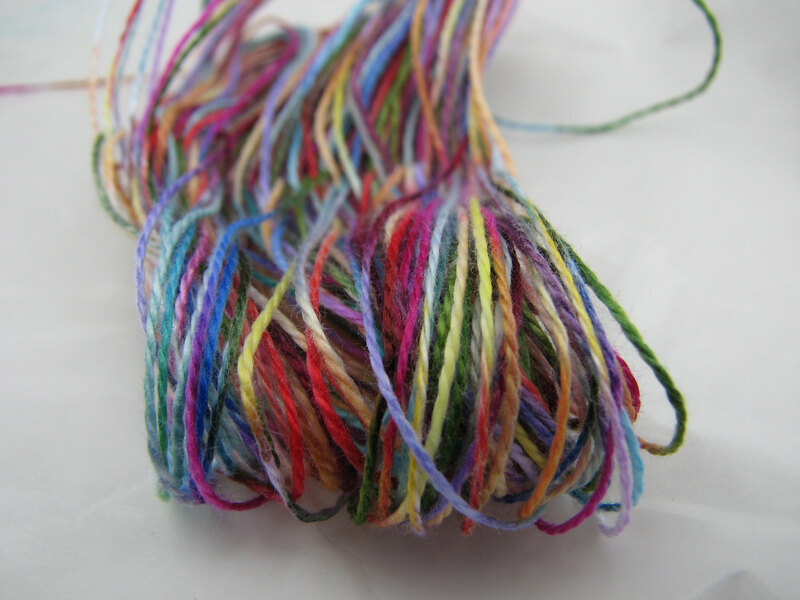 Remove the excess water by rolling the yarn in paper towel. Heat set it. I threw my yarn in the dryer in a lingere bag, but you could use an iron on a work surface that you don’t mind getting a little ink on, like an old towel or sheet. Once it was heat set, I only noticed a small amount of color on my fingers, but I think that is because I used red. You know how red is! And, I only rinsed it in water once. So there you have it; a faux “painted warp”. It will be fun to weave something with it! What do you think? If you give it a try, please do let me know how it turns out. So pretty! Would love to try this sometime. This is such a wonderful idea, thanks for sharing, I’m definitely going to try it. Have you already used this yarn in a band? I also love your bangles from another post, they were really skillfully made. I noticed you haven’t been blogging lately, but hope for more inspiring posts to come! Hi Skogsduva. Thanks for reading. I have been away for a bit, missed it a lot. See the Feb 14 post to see what I’ve been up to. This yarn was one of those ideas you get and are elated when it works. I did weave a band with the yarn but it ran when I washed it because I was too excited to use the yarn that I didn’t set it. I think a bit of it mixed with other yarn is the best way to go. Good to see you’re back, congratulations with your baby son! A pity that the colours ran, I’ll keep in mind to set it properly.